Egg Salad. It had been over 15 years since I had tried a bite of egg salad. The only reason why, was that I had always disliked it and that’s just the way it was; which worked, until I started lunching with preschoolers. Our shared expectation is that everyone has a taste of food that is new to them, or of food that they haven’t tried in a long time… My so-called-excuse was no longer sustainable; I simply had to try eating egg salad. So there I was faced with my reality: a contrite teacher, ready for a tasting portion. Of course when I tried egg salad from our kitchen this year, I loved it. When picky​ ​eaters​ find a food they like, they want to share the experience with others. It feels good to find something you like and to relate to those who also like it. But how do we encourage our kids to give new or unfamiliar foods a try? One way the preschoolers have been trying new foods is from visiting the garden. Just this November we were able to go up with our Garden Coordinator and Chef Jannelle to harvest Kale, Swiss Chard and Romaine lettuce. 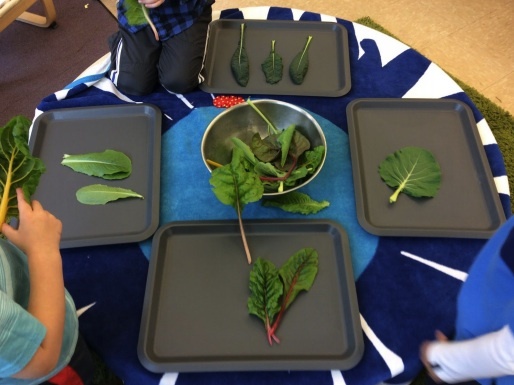 The children worked carefully pinching and pulling, cutting and harvesting; the same greens that would end up back in our classroom a few hours later for snack. Q:​ ​What​ ​do​ ​you​ ​like​ ​about​ ​eating​ ​greens​ ​you​ ​picked? Amina:​ I really like it, because I had a great time picking it. Steve:​ About dipping it in the salad dressing, ‘cause it tastes so good! Sammy:​ Good, picking things by myself. Harper:​ I like eating it for snack. Gwyneth:​ Just eating, just looping it around in the salad dressing! As teachers and parents, we need to celebrate adventurous eating at our tables, and avoid putting the focus on picky eating. Grace Rotzel wrote about what lunchtime was like for their preschoolers in her book, The School in Rose Valley. Lunch is a critical bonding time for our students who are practicing many skills involved with eating; whether they are here as preschoolers or as fifth and sixth-graders. As our students continue to work more collaboratively in the school garden, they are beginning to see new connections to the food on their plates. 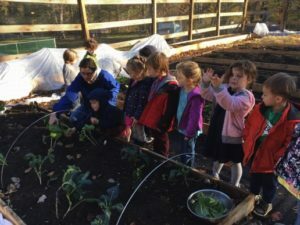 These food adventures are what build new shared experiences around food for our children; it is also a critical part for connecting with their classmates socially. That is why when I watch our students harvesting, tasting and celebrating the food they grew, I know we are feeding them more than just lunch and they are eating more than just food. 2 Rotzel, Grace. The School in Rose Valley: A Parent Venture in Education. The Johns Hopkins Press, 1971.